Kaatru Veliyidai, the movie from a team of Legends ManiRatnam and ARRahman, has finally released, it has Karthi and Aditi as Lead. The film released with a huge expectation especially from the Mani Sir lovers. 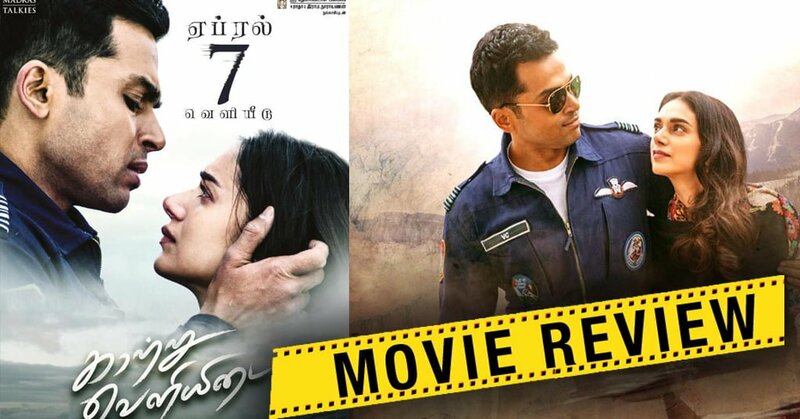 Lets us see the review of Kaatru Veliyidai Movie now. The movie has a plot with a complicated love story with Airbase in the background. It shows both the positive and negative shades of the lead and the effect it has on his love. The First half was mainly covered by the songs, and the visuals were damn Good. The story moved at a snail pace. After the first half, almost all audience were a bit disappointed. The only satisfying thing is the Technically Brilliant Visuals and BGM. The Performance of both Karthi and Aditi are good. RJ Balaji has nothing more to offer, very little space for him. It was a shocker to see RJ Balaji with a very few dialogue (Typical Manirathnam Touch). Second Half was mixed with emotions and complicated love story. The film was disappointing in most parts. The Performance, Cinematography, BGM and songs were the only savior. The film was not engaging in most areas. Personally, see many Audiences started using mobile phones showing less interest in the movie. Having such huge expectation, the film failed to deliver. There was love and love only! Has all Maniratnam elements but still lacking something big. Disappointed !! Verdict: Technically Great but Disappoints Big time! Any thing there from Movie???? one little war from Pakistan . if want money kindly go to another business. okay. future youngsters time and money is responsible and valuable one. Karthi sir roles. pilot war!!! but nothing to seen from movie.